Club Penguin Cheats by Mimo777 Club Penguin Cheats by Mimo777: Orange Puffles? Now BROWN Puffles? Club Penguin is Going Puffle Crazy! Orange Puffles? Now BROWN Puffles? Club Penguin is Going Puffle Crazy! Ok, I just ordered a BROWN Puffle from Toys R Us. I talked the operator and they confirmed that it is a BROWN Puffle. Even though if you look closely, the picture is of the BLACK Puffle. So, is there a BROWN Puffle? We will see. I will show you once I get it. If you find a REAL pic of a BROWN Puffle, sent it to me! I'll give you credit. Here is the weird thing. Why hasn't Club Penguin put it on their site yet? There are many wierdness things about this orange and Brown Puffle thing. I also got confirmation that the ORANGE Puffle will be released at the end of Febraury. I'll keep you posted with real and accurate information. on toys r us.com if u look at the black and brown puffle their color looks exactly tha same!! Wait... DID YOU SAY ORANGE PUFFLE WILL BE ON CLUB PENGUIN AT THE END OF FEBRUARY!!! Sorry for caps mimo and golly ge i have a question for the CPG7 u knowww can i be the in the CPG8 if u know what i mean wink wink. Sorry, but you have to be family or a close friend. It says black puffle and looks exactly like the brown puffle. That's so a black puffle. I JUST GOT ONE TOO! oh yeah brown puffle commin my way!! I know! Maybe they thought it looked brown and just wrote it. I am super sad. i just fractured my pinky. It kills like crud. mimo u need to check out the stage look really deep into the bookshelf theres blinking puffle eyes!!!!! Mimo, I dont think there is a orange puffle. I checked it in Toys R Us, Target, Walmart, and the Disney Store! Mimo do u believe it true that they will come out with them on cp??? Wow! LOL! Gud research u passed LOL! I know I was looking for some club penguin toys online. I belive you, Mimo, but I can't see ANY brownness on the puffle. i looked at the brown puffle and then the black puffle, and I could see a difference between the colors!! Just like the penguin colors light blue and aqua!! Awesome I Hope I Can get One Soon! Man, I wish CP would just stop! I think that they're coming out with too many new, "great" ideas. Just another excuse for people to pay for memberships. Pretty sad, really. Yeah... exactly... Did you notice that the expression on the "brown puffle's" face is the same as the black one... both grumpy? Hey mimo its my birthday tomorrow!!!! Woot~woot! P.S. Are u a sis or a bro? Mimo I found a cheat in the F.I.S.H.! When they show u the spy phone diagram, click on the antena. It has a message in the spy code! The message says: The red light spells "You are cool" in Morse. Orange Brown Orange Brown.hmmm, It can only mean one thing! A Brown AND orange puffle!Ok.So now i havethree things to look forward to.One is my birthday, which is coming in exactly one week. Another is this brown/orange puffle, last of all, The new mission. Im not too intrested in the yeti cave experience on clubpengin. It is not black if you look closely it is very dark brown.I thought it was black at first but i went to my shelf got my black puffle and it doesn't match or it doesn't look like it does i think it is brown. I have an idea, maybe these puffles will be discovered in the caves that we are digging out! Wow thats a good idea, i never thought of that. Then why is there still black puffles? If they made them brown then why is the black puffle out? this is actually an illusion. Club penguin used a very dark brown to produce the 'black' color. If it was completely black then you won't be able to see the mouth. I bought a black puffle and my friend picked up that it lookesd brown. It is a brown color in the sun. I think Club Penguin is going to release a mass number of puffles of different at the same time. These will all be member only puffles :(! Therefore by doing this more people will beg parents for memberships and Club Penguin will get for money!!! It is all for profit. Mimo, this is because of the felt and thread that they used to make the black puffle. It was probably supposed to be black. Anyway, the person who confirmed that it was brown, probably had never been on Club penguin before, or else she would have known. Really cool, but you may already know this but the ninja is back in the loge and the gift shop. You proble already know this but thought i would just let you know. Hey mimo you mite digg up the rocks and find a brown puffle??!! But it Probaly will be members only. Wow! I think club penguin wants to make us suspicious and then realease those after a while when we forget about it! Or they where coming up with some stuff and they wanted to let us know to keep our eyes out for puffles. Mimo knows this already, thats why there is a post where he states that the orange puffle is a fraud of the red one. However, there is a brown puffle, but it is not the one in the picture. Actually, this cheat is really old. Mimo definitely knows about this one. And yes, you can put CPG Mod at the top, or sign off as CPG Mod. Read his mod post. Sorry, but you can't post URLs! But thanks! I ALWAYS WANTED AN ORANGE PUFFLE! Wait a sec! CP made the black puffle brown BECAUSE its mouth and outlining of the eyes is black. Been a long time since I heard Puffle Ragtime! THATS A BLACK PUFFLE.That guy at toys r us had porbaly never herd of cp. ITS MENT TO BE BLACK!!! wow this weird even if they are new puffles it's weird that they come out at the same time. cool orange and brown.... we only need rainbow puffles now!!! i cant wait!! Yeah , Mimo if you zoom in on the picture it does really look brown. To tell you the truth I have a black puffle and it is brrown not black. The operator is just going by what color it is not what it says. By the way MIMO u are the best!!!! And Mimo THERE is no orange puffle!!! I MEAN IT!!! P.S Sorry for the caps. Its not a brown puffle, though the black puffles do look brown. I dont think its a brown puffle. Also Mimo, how weird is it that the White Puffle is smaller than the others? Mimo, that links to a black puffle you silly goose. 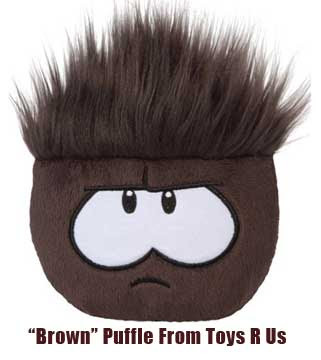 Toys R Us has conned alot of people into buying a 'Brown' puffle. Look back at the page to see it's not called a Brown Puffle... It's a Black one again... shame on you Toys R Us! On behalf of the CPG10, we would like to invite you to join us to become the CPG11! If you accept, or have any questions, please contact any member through Polkadotblu9's blog. Thank You! It's just a black puffle. When you click on the link it takes you to the black. I think toys r us messed up. dear Hnwjanuary11, CPG8! (CPG Super Mod) no offense, but in some posts, you were sorta mean! so please be nicer in the future! I speak of everyone in CPG or goes to CPG! it iz a pic a of a black puffle but i promis u when u get your's it will be brown i PROMMIS. I think that someone edited a red puffle to make a pic of an orange one and the black puffle just happens to be a bit brownie coloured!! I love brownies!!! Thanks very much for taking the time to contact us. I understand that there has been some confusion about the black puffle looking brown on some websites. Please know that this puffle IS a black puffle. There certainly are a lot of rumors going around about different color puffles. I assure you if there was a new puffle discovered, you'd hear about it on the What's New blog first! If you have any other questions, please be sure to let us know. We're always here to help! And now you can see Toys R Us has the black puffle as black puffle.